The Catholic Company kindly offered me an opportunity to read and review the book Catholic and Confident by Henry Libersat. Thought I would share my review here for others who want to feel more confident when talking about their Catholic faith. “Have Catholics been saved?” “Why do you worship Mary?“ “Why do you pray to the saints?“ “Why do you call your ministers “Father?" If you are a Catholic who has non-Catholic family and friends, you may have been asked these and many other questions. Explaining our faith isn’t easy for most Catholics, who haven’t been trained to evangelize like some of our protestant brothers and sisters. We may feel unsure of what to say and how to adequately describe our faith. 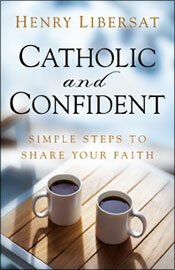 Henry Libersat’s Catholic and Confident: Simple Ways to Share Your Faith can help. Libersat, who has a master’s degree in pastoral ministry and is a permanent deacon in the Orlando diocese, shares ideas on how we can embrace Pope John Paul II’s call to spread the Good News to everyone we meet. This 93-page book shows Catholics that they need not to be afraid or intimidated about sharing their faith if they let the Holy Spirit guide them. He urges the reader to start his journey by recognizing God’s call to evangelize, and then preparing oneself for the task by reading scripture regularly, making prayer a priority in your everyday life and by attending Mass frequently. Really knowing your faith is key to confidently sharing it with others, according to Libersat. He then makes the process less intimidating by suggesting that we look for simple ways to evangelize. Sometimes this means being a “wordless witness." “If you are holy and happy, people will know you are somehow different, and they will want what you have," Libersat states. He gives an example of a husband who realized that his wife’s serenity was based in her Christian beliefs. His yearning for similar demeanor propelled him to seek a fuller relationship with God. Sharing your story can also be a powerful evangelical tool, according to Libersat. He gives five helpful hints on how to develop and organize your story in a way that will be meaningful to others, such as describing your life before you came to know the Lord and how you changed emotionally after Christ became an important part of your life. I especially liked his examples explaining how others shared their stories in an unassuming way during their everyday encounters with others who had false impressions about the Catholic faith. Libersat’s chapter on evangelizing to your family is especially helpful to those who have children who are lukewarm in their faith or feel alienated by the church. He focuses on teens and young adults who may be questioning their faith. His advice suggests building a relationship based on compassion and understanding, which will help you and your teen weather his stormy years of self discovery. Libersat states that your strong faith provides a safe environment for teens and young adults while they maneuver the difficult years. He also includes a chapter about the ministerial gifts of the Holy Spirit and how you can match those gifts with your own talents, then use them to serve your parish and community. Each chapter ends with two or three questions prompting the reader to reflect and take action. The questions make this a good book for Catholic book clubs or Bible study groups. He finishes the book with a list of Catholic evangelical ministries and organizations that can help you grow in your faith while sharing the Good News with others. I think this is a very helpful book for anyone who wants to feel more confident when she talks about her Catholic faith. Libersat’s stories will inspire you while his easy-to-implement suggestions will make you feel like “I can tell others about my faith!” It would also be a good stocking stuffer for a Catholic friend or family member. This review was written as part of the Catholic book reviewer program from The Catholic Company. Visit The Catholic Company to find more information on Catholic and Confident. The Catholic Company is the best resource for all your family Advent activities and supplies this year, such as Advent wreaths and calendars for kids, as well as Christmas decorations such as nativity scene sets and religious Christmas gifts for the whole family.